The New EXCEL Gas Sample Cooler has been designed to cater to meet sampling requirement of today's highly efficient high-pressure power plants. 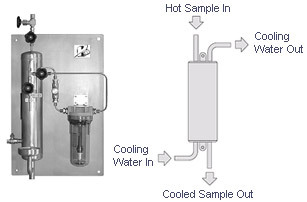 These coolers are compact yet more effective in terms of heat extraction capacity. Very close approach temperatures with minimal cooling water requirement. It's very compact compared with the service it is put to. Facilitates routine on-site maintenance easy. Coils can be cleaned in-place.